Another new art trend rapidly developing involves printing art and photographs on polished acrylic. It is gaining in popularity because polished acrylic prints provide spectacular clarity. Acrylic prints also offer the sharpness you won’t find on a paper print. In fact, some people say these prints are ultra-crisp and have a radiant quality. What Makes Our Acrylic Prints So Special? Simply put: image clarity distinguishes our acrylic prints from our competitors. Our acrylic prints have stunning clarity and sharpness. Our superior acrylic product results from the printing process. We differ from the services of other photo labs in the basic printing process. Other photo labs print onto paper first, which sits under the surface of the acrylic. This often gives our competitors’ acrylic prints a hazy, diffused, or muddy appearance. Instead, our lab prints directly onto the acrylic substrate. The result places the art directly on the acrylic instead on the intermediate paper. Another benefit of our process is the elimination of bubbles that can create a diffused look in the final print. This often happens when the paper doesn’t bond correctly, or because the acrylic is not smooth and highly polished. Instead, because our process involves printing onto the acrylic, it produces a translucence effect which is not possible with paper printing. Our digital grade acrylic measures .220" thick. 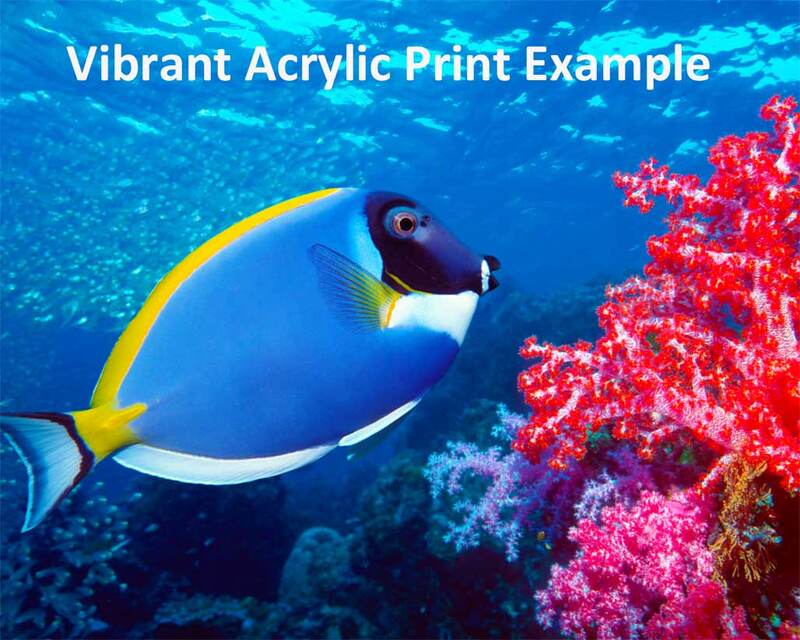 Images printed on acrylic will result in brilliant colors. This makes them perfect for home or commercial use. For protection against fading, a UV flood coat offers image protection. The finished print has smooth, polished edges. It also comes with a recessed float mount frame with a nail groove pre-installed on the back. The pre-installed hardware makes the art ready to hang on a wall as soon as you get it out of the box. With the inset frame, each print appears to float ½” off the wall. Acrylic prints are easy to care for and clean. Just buff them with a microfiber cloth and your acrylic print will glisten and gleam like the day it was made. Overall, printing on acrylic is a good choice. As mentioned above, they have a super reflective and translucence quality that provides your images with vibrancy, added depth, and dimension. Acrylic prints also offer sharp contrast and crisp lines in the completed art. This makes acrylic printing ideal for photographs involving water, sports, macro photography, architecture, families, and studio portraiture. Begin today to experience this great acrylic product. Typical turnaround time for acrylic printing is about 2 weeks, or less. We are located at 10070 Ford Avenue, Richmond Hill, GA. Feel free to stop by and see first-hand the vibrancy of acrylic printed art. If you have any questions, please feel free to contact us at 912-756-2781.